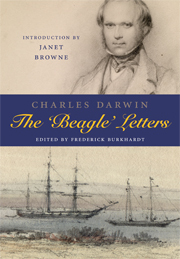 Charles “connoisseur of deserts” Darwin has reached Cape Town, which he finds to be a great mass of boarding houses and inns, bustling with travelers to the far East and back. The word “Nabobs” refers to people returning from overseas, often India, having acquired wealth there. Towards the end of the letter, rather amusingly, Darwin is frightened about the circulation of his field notes in England before he has had a chance to edit them properly. To be fair, Henslow, who circulated the notes, did so with an extensive caveat. Farewell for the present & God bless you all.— I have a strong suspicion that my Father will hear of me again before the time of sailing, which will happen in 10 days time.— Give my love to the young Miss Parker; for I hope I have a little niece, instead of a fifth nephew. My dear Catherine | Your affectionate Brother. C. D.